Thimphu, the capital of Bhutan secures a sound place in the bucket list of the wanderlusts. 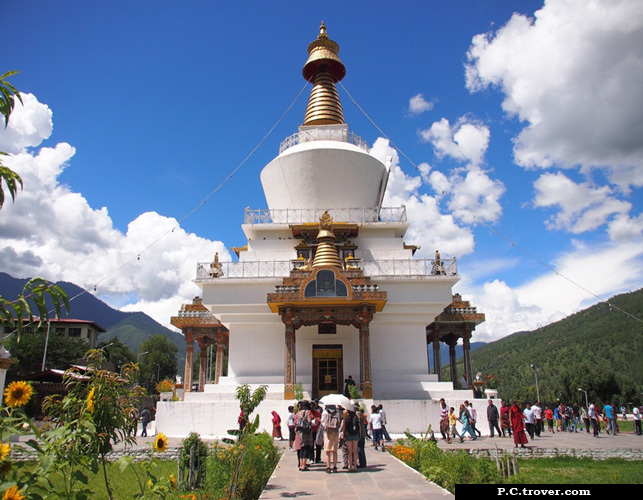 Explorers get to appreciate the aesthetic beauty by exploring the top places to see in Thimphu. The largest city of Bhutan is free of traffic lights and maintains a bizarre blend of traditions and modernity. Sauntering around the city renders the sight of old fortresses co-existing with cafeteria and restaurants. On visiting the monasteries you will see crimson-robed monks and traditionally clad nationals circling around the monastery by chanting mantras and counting prayer beads in absolute devotion. 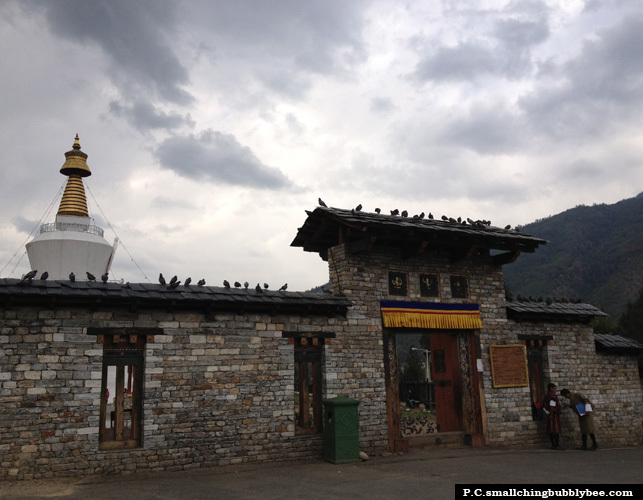 Built-in 12th century, Changangkha Lhakhang is the oldest temple in Thimphu. The temple houses the central statue of Chenrezig, a manifestation of Avalokiteshvara with eleven heads and thousand arms. Perched on the ridge, it offers a mesmerizing view of the enclosing Thimphu valley. 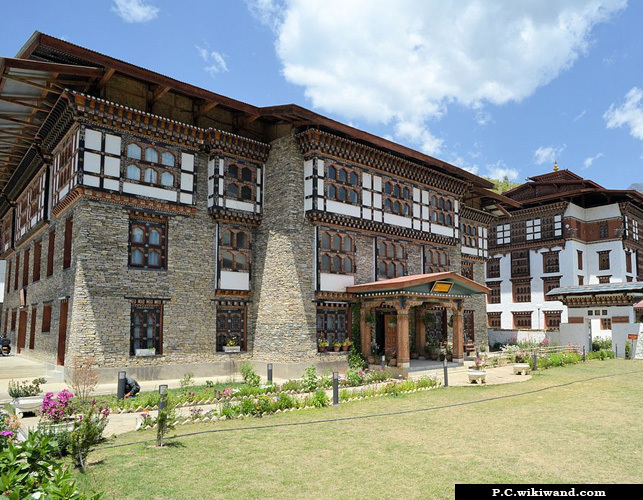 The structure is a fine example of Bhutanese faith, tradition, and architecture. Location: Thimpu, 10 minutes drive from the main market. Timing: 08:30 AM – 05:00 PM. Established in 1967 National Library of Bhutan promotes the religious and cultural heritage of Bhutan in the form of ancient printed resources related to history, religion, traditions, and culture of Bhutan. It owns one of the largest holdings of Buddhist Literature in the entire world. It has 6100 Bhutanese and Tibetan books, xylographs and manuscripts, and 9000 printing boards and wooden printing blocks for religious books. Based at an altitude of 10,171 ft on east-west route from Thimpu to Punakha, it is one of the best tourist places in Thimphu. The ravishing 108 chortens with beautiful adorned stands against the lush green forest backdrop, while a clear day, offers a jaw-dropping view of snow-decked mountains and the colorful flags fluttering in the wind. Location: Drive to east-west Road from Thimpu to Punakha. Best time: March to May and September to November. The outstanding illustrations of Buddhist architecture, the whitewashed structure is crowned by a golden spire and is carved with intricate patterns. The spire emanates with the golden glow with the first ray of morning sunlight. 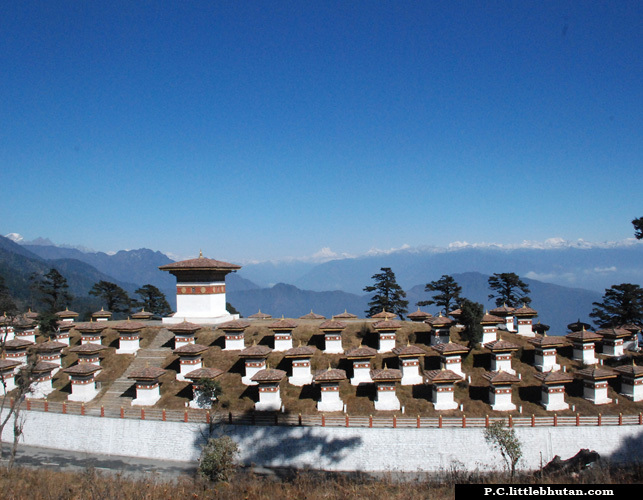 Built in 1974, it is an important religious place for Bhutanese for daily worship. People walk around the perimeter of the Chorten throughout the day as a holy ritual. Location: Doeboom Lam in Thimphu near the Indian Military Hospital. Time: 07:00 am – 09:00 am. 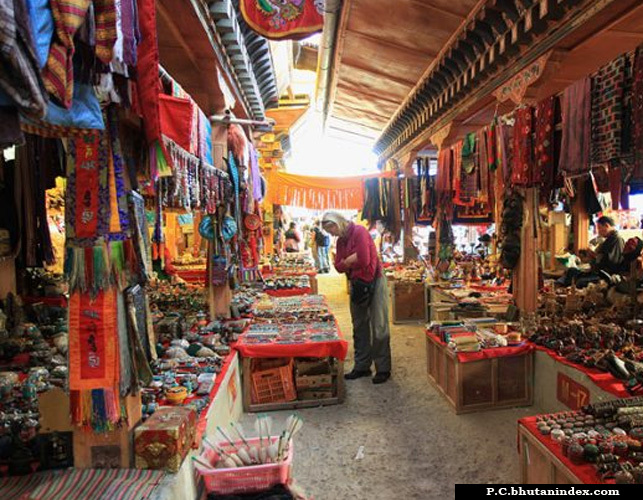 One of the gaieties Thimphu tourist places draws vendors from all over the region. They start arriving at the banks of Wang Chhu River on Thursday or Friday and remain until Sunday night, which is why it is called as Weekend Market. The market abounds with freshest organic produce, a wide variety of fatty pork, dried fish, homemade soft cheese, leg of Yak, seasonal fruits, curly fern, etc. 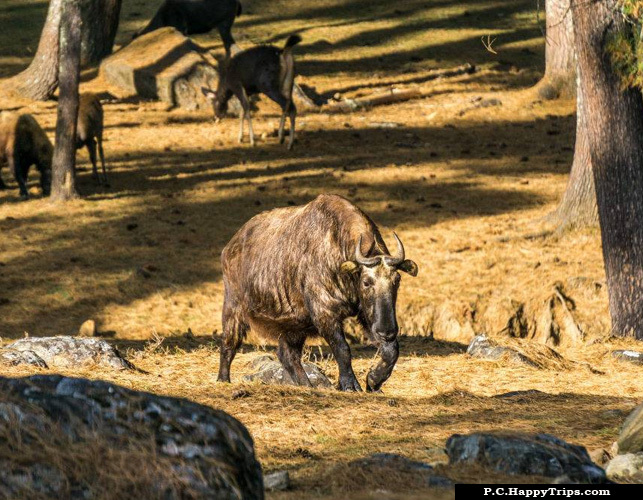 Motithang Takin Preserve is the dwelling place to Takin, the national animal of Bhutan. It is famous for interesting wildlife and its scenic beauty. Initially, the place was a small zoo which was disbanded by the fourth king of Bhutan. However, when the mammals were released in the wild, they avoided dwelling in the woods and kept coming back to streets. Therefore, the whole area was declared as a preserve. This impressive structure with whitewashed walls, golden, red and black wood and lush gardens on a backdrop of blue sky and flourishing green valleys, emanates a look of splendor. This remarkable architectural structure is the administrative seat of the monks. 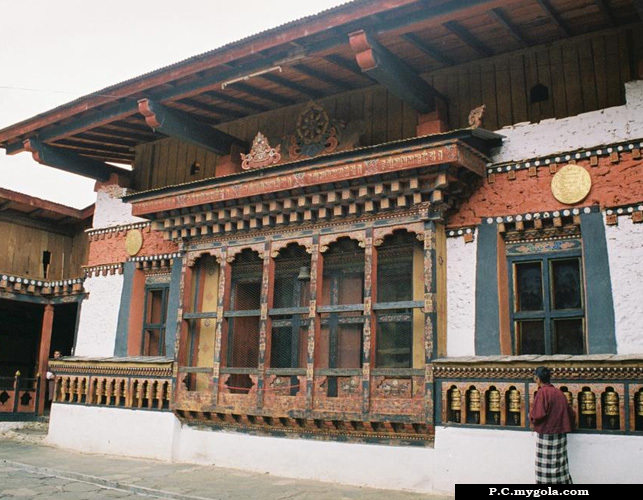 This Thimphu places to visit is commonly known as the Thimphu Dzong, it is also called the ‘fortress of glorious religion’. Location: Thimphu, on the west bank of Wangchhu River. 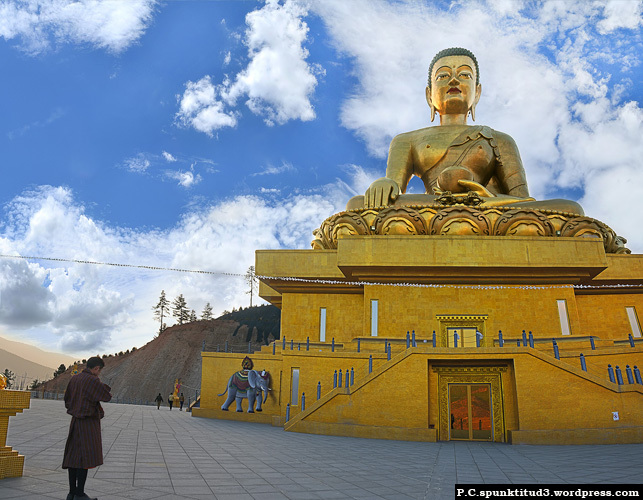 Buddha Dordenma is a masterpiece of architectural wonder and one of the largest Buddha statues in the world. Glided in gold, this massive bronze statue is more than 50 meters in height and houses 125,000 other miniature Buddha statues. Sitting royally atop a great meditation hall, this Buddha statue exudes peace and tranquility, representing a manifestation of human faith, everlasting peace, and happiness for all human beings. Location: In the southern entrance to the valley of Thimphu. If you are keen to have a glimpse of the interesting rural life of Bhutan, this place is probably the best for you. The Folk Heritage Museum is a three-story timber building, established in 2001. Similar to the traditional farmhouse, it appears like it has been furnished about a century ago. It provides the tourists, an insight into the Bhutanese lifestyle and culture. Location: Pedzoe, Lam in Thimphu. Time: 9:00 am to 4:45 pm (Monday to Friday) and 10:00 am to 1 pm (Saturday and Sunday). 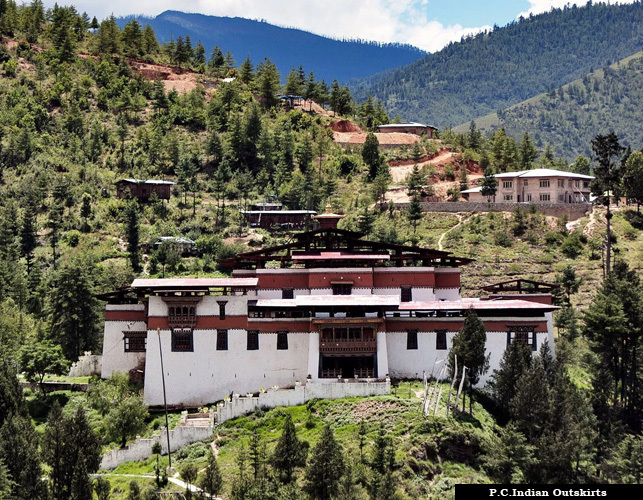 Simtokha Dzong is one of the important Thimphu Bhutan places to visit, and was made after the Gyal Tshel Institute of Ralung to subdue an evil spirit that was harassing the travelers of the region. It owns countless paintings and statues of Buddha, religious figures, and other deities including the eight manifestations of Shakya Gyalpo- the Buddha of Compassion, Guru Rimpoche, Jampelyang- the Bodhisattva of Wisdom and many others. 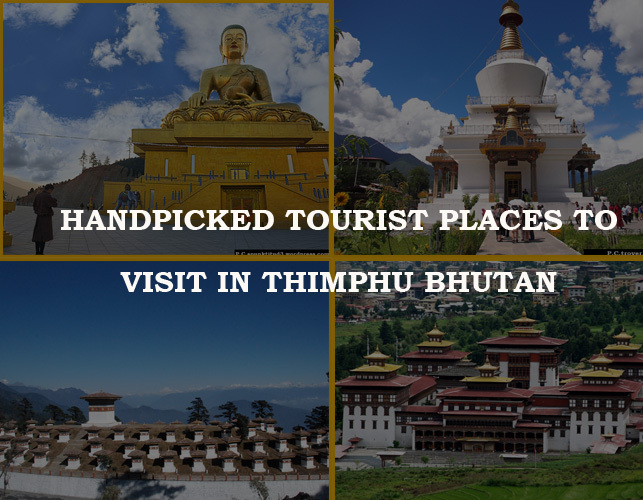 If you’re planning a trip to Bhutan this holiday season, then make sure to add these mentioned above places to see in Thimphu Bhutan. 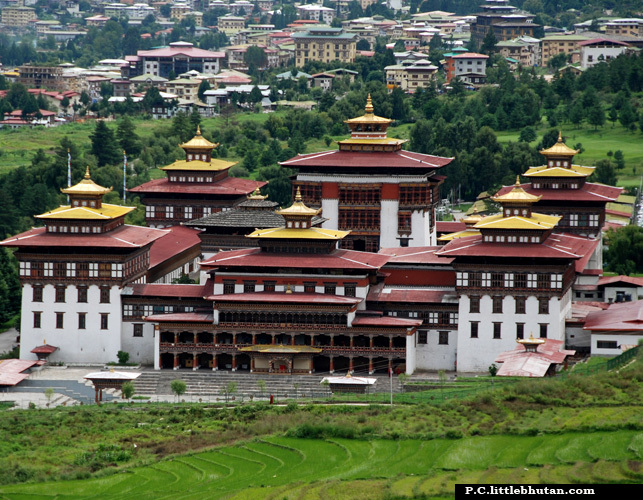 Besides, you can avail for the Thimphu Bhutan tour packages that cover all the travel necessities under one-time cost. Your customized travel packages cover Ticket booking, airport/railway transfer, Hotel booking, meals, booking cabs, Thimphu Bhutan travel guide, sightseeing, visas, permits, and all the travel related problems.